They're created to offer comfort and entertainment to young children everywhere. But do they always do what they're supposed to? Strangely, no. It seems like some dolls have their own unholy agenda. So, since we can't get enough of all things creepy and supernatural, we've compiled a list of the top 10 real haunted dolls. Enjoy! "Lou awoke one night from a deep sleep and in panic. Once again he had a reoccurring bad dream. Only this time somehow, something seemed different. It was as though he was awake but couldn’t move. He looked around the room but couldn’t discern anything out of the ordinary and then it happened. Looking down toward his feet he saw the doll, Annabelle. It began to slowly glide up his leg, moved over his chest and then stopped. Within seconds the doll was strangling him. Paralyzed and gasping for breath Lou, at the point of asphyxiation, blacked out. Lou awoke the next morning, certain it wasn’t a dream, Lou was determined to rid himself of that doll and the spirit that possessed it. Lou, however, would have one more terrifying experience with Annabelle. Preparing for a road trip the next day Lou and Angie were reading over maps alone in her apartment. The apartment seemed eerily quiet. Suddenly, rustling sounds coming from Donnas room aroused fear that someone had possibly broken into the apartment. Lou, determined to figure out who or what it was, quietly made his way to the bedroom door. He waited for the noises to stop before entering and turning on the light. The room was empty except for Annabelle, who was tossed on the floor in the corner. Lou scoured the room for forced entry but nothing was out of place. But as he got close to the doll he got the distinct impression that somebody was behind him. Spinning around he was quick to realize that nobody else was there. Then in flash he found himself grabbing for his chest, doubled over, cut and bleeding. His shirt was stained with blood and upon opening his shirt there on his chest was what looked to be 7 distinct claw marks, three vertically and four horizontally, all were hot like burns. These scratches healed almost immediately, half gone the next day, fully gone by day two." Amanda the doll is no stranger to Ebay. She's been up for auction over 20 times. Each time someone purchases her, the owner tries to get rid of her, often within the same year. When unhappy, the doll supposedly moves around of her own free will and causes terrifying nightmares. She now lives with paranormal investigators in Atlanta, Georgia, where she can be heard scratching the case that contains her. "Harold was originally put up for auction in 2003. He is supposedly the first haunted doll ever sold on eBay. The listing Greg wrote made him the subject of websites, and news articles around the world. I didn’t see the original auction, until Kathy, who won the auction put it up for sale a year later. Kathy told me that the reason she bid on the doll was not because she believed the stories, but because she wanted to learn doll restoration, and her teacher told her that this doll was perfect to learn on. A year later, after having a number of personal experiences, including the deaths of two people she knew after they came in contact with Harold, she decided to put the doll back up for sale. When I saw Kathy’s auction on eBay, I looked at Greg’s original listing and literally laughed out loud. I didn’t believe a word of it or the video he posted. So how did I end up owning this doll? Kathy had a reserve on her auction, and I was curious as to what it was. I kept putting in bids until the reserve was met. I received an email from Kathy which started by saying, “I don’t believe Harold is haunted, but I do believe he’s cursed.” She went on to say why she thought so, and asked why I wanted the doll. I told her I didn’t want the doll. The next day I was outbid by someone calling himself, “Strange Majik.” He told me not to bother bidding any more because he’d just outbid me. “You might,” I thought, “but it’ll cost you.” My plan was to bid him up and then dump the auction on him. It didn’t happen that way. I ended up winning the auction. Kathy was genuinely worried for me and offered to let me out of the deal, but I declined. After all, I told her, a deal is a deal. Shortly after I received Harold I asked a friend of mine to do a reading on him. I recorded the reading. It didn’t last long, maybe a minute or two, at the most. I was stunned. I had more readings done, and seen people physically hurt in front of my eyes while in Harold’s presence. I put Harold in storage in 2005, only taking him out occasionally after that. This past June, of 2013, I took him out of storage to continue my investigation of him. So far, four psychics have done readings on him, and none of them wanted to have anything to do with him afterwards." Pupa had the same owner from the 1920’s until the owner died in 2005. The original owner said that Pupa was alive, and always considered the doll to be a beloved friend and confidant. They would talk to each other and, supposedly, Pupa had even saved her owner's life on one occasion. When her owner died in 2005, the family reported that the doll had become very active. The display case where Pupa is kept has been reported to fog up, revealing the words "Pupa hate" on the steamy glass. Pupa is said to move all by herself. She can also move the items around her, and make tapping sounds on the glass of her display case. One lucky family member managed to record the doll walking around within her case, but whenever he tried to upload the video to Youtube, the video appeared to be obscured by a thick white film, and the words "Pupa No!" were visible on the film in childish handwriting. Well, this doll is not recommended for the weak at heart or for any little kids to have in their bedrooms! She's too creepy!!! But to get to the doll info, she was made by Hamilton Collection in 1994 and is hand numbered 2225b and her name is "Amelia." She stands 19" tall and comes with a deluxe doll stand! OK, now for the good stuff!! I not only sell on eBay, I am also a paranormal investigator! Well, we investigated our first house last week and the place was over one hundred years old! The woman who lived there claimed to get woken up every night by a crying baby. 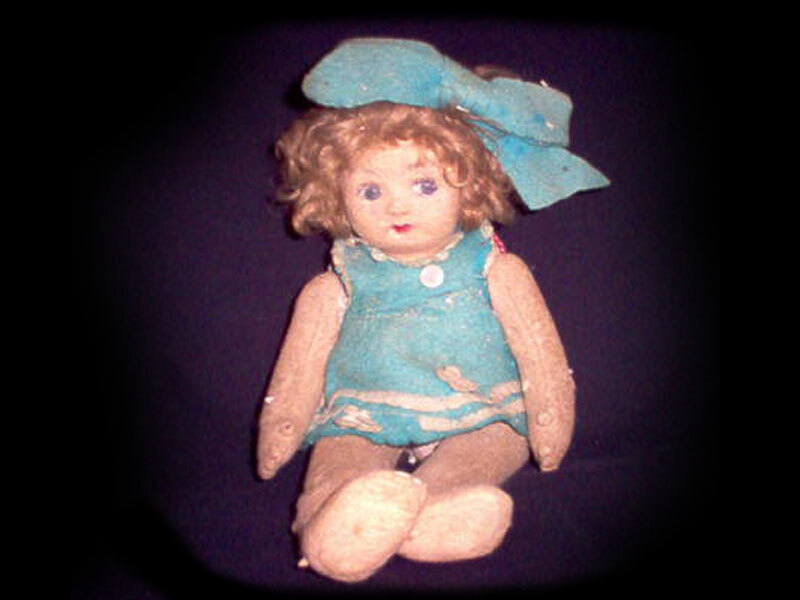 She also claims this doll, Amelia, entered her home with blue eyes. She has kept her out of the sun and intense light. She said the happenings started the second the dolls eyes turned green! She wanted the doll out of her house and who better to give the doll to but a paranormal investigator! I did some emf field tests on the doll and she pealed at a 2.2! There is no other electrical interference in that area of the room!! I also moved the doll around the room and the EMF readings were between 1.8 - 2.1. A note...I am not allowed to give out our paranormal website or name due to eBay regulations! I also cannot guarantee the doll being haunted! I am only reporting a story and my paranormal findings! So don't expect the doll to jump out of the shipping box and chase you if you win this auction! Thanks for looking and bid today!!" "Joliet the Haunted and Cursed Doll, sometimes known simply as Joliet, is a doll that is supposedly possessed. According to legend, this doll was passed on from generation to generation to expecting mothers. Each mother was cursed with having two children - a boy and a girl respectively. The son isn't expected to live long; each boy lives to be about three days old before succumbing to unknown circumstances. It is said that the doll traps the souls of the boys within its body wherein they are expected to remain until Judgment Day. Legend has it that it began when a woman received the doll as a pregnancy gift from a friend. This friend despised her for some unknown reason, and it's believed that she placed a curse on the doll out of jealousy. Three days after her son was born, he was stricken with a malady and died. Sometime after the death of her son, she heard crying that seemed to be emitting from the doll. Upon closer inspection, she concluded that her son's soul was imprisoned within the doll. Robert, otherwise known as Robert the Doll, Robert the haunted doll, or Robert the Enchanted Doll, is a doll that was once owned by Key West painter and author Robert Eugene Otto. The doll is alleged to be cursed. Robert was the inspiration for Chucky, the doll in the 1988 horror film Child's Play. The doll is currently located at the East Martello Museum. Supposedly, Otto was given the doll in 1906 by a Bahamian servant who practiced black magic and voodoo. Otto's parents often heard him talking to the doll. At first they assumed that Otto was simply answering himself in a changed voice but later claimed to believe the doll was actually speaking. Neighbors claimed to have seen the doll moving from window to window when the family was out. Otto died in 1974. The doll is annually rotated to the Old Post Office and Customhouse in October. Strange activity in the museum supposedly increases during such times. The doll was shown at Taps CON, a paranormal convention held in Clearwater, Florida in May 2008. This was the first time that it had left Key West, Florida in its then-104 years of existence. The doll is currently located at the East Martello Museum in Key West, Florida. Which doll did you find to be the scariest? Let us know in the comment section below!